Two years ago, I bought a New Zealand Red baby from a local 4H girl. 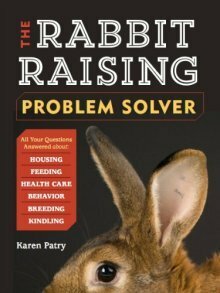 I had heard that rabbit manure was great for vegetable gardens, so I starting looking into breeds. 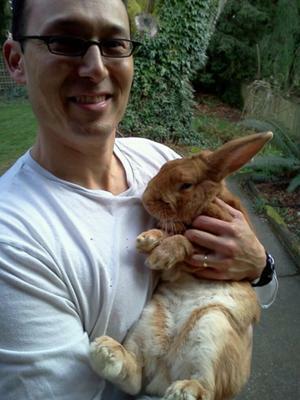 I wanted one that was large and strong, so that he could be let free to roam our backyard during nice days. Oscar is two now. He lives in a large hutch on our back porch for six months of the year, and is let out to roam free every day that it's not raining. In the winter, we move his hutch into our garage, and carry him out on the odd dry day. He has a ramp to the ground that my son built him, and goes in and out of the hutch during the days outside. He is very smart to nap under the shelter of trees or logs or under our bench swing, where a hawk could not surprise him from above. He is about 11 lbs. now, and has a bit of a dewlap, although he is male. He absolutely LOVES our dog, a bichon-shih tzu cross. Whenever we let Gipper, the dog, out in the yard, Oscar follows him and circles him relentlessly. He is not afraid of Gipper's barking at all. In fact, Oscar was also totally unafraid of the neighbor's two terriers either, and calmly eats right by the fence where they are madly barking at him. Last summer, he made the mistake of digging under the fence and visiting the neighbor's dogs. After a mad dash around their yard and a near bite, he came back under into our yard. He was definitely in shock for the next 6 hours or so, and we were afraid we would lose him. We held him and kept him warm as his temperature dropped. After a few days of TLC, he was back to himself, and I am glad to say, he has stopped digging under the fence! Oscar is unpredictable and does bite hard, although he is getting calmer with age. When he is outside and doesn't want to be corralled back into his hutch, he runs and sprays urine toward us. He is a hot-headed red-head! 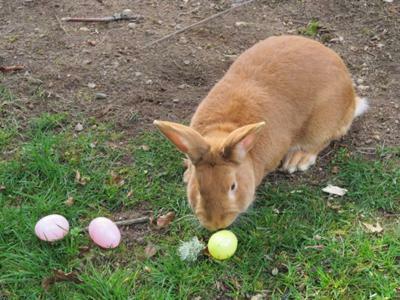 Wonderful story, and I hope you're having good luck with the rabbit waste! Our veggies and flowers thrive in the spring when we mix it into the dirt in the fall. Beautiful rabbit, wish I had a red. You have a very smart guy!